What is external tibial torsion? Tibial torsion refers to an abnormal rotation in the tibia (shin bone). If you look at your patella (knee cap) and look beneath it, there is a bump called the tibial tubercle. The significance of that bump is that it serves as the attachment of your quadricep via the patellar tendon. The patella sits just below this large tendon. Dynamically, torsion is considered normal when the joint is moving from 20 degrees of flexion to full extension. As the knee is flexed, it is in an internally rotated position, and as the knee extends, it externally rotates. This is called the ‘screw-home mechanism’ and locks the knee into a stable position (Kim et al., 2015). When it locks into extension, the tendon should be straight up and down and if not, the angle of the tendon influences how the patella tracks within the trochlear groove (the end of the femur that articulates with the tibia). If the tibial tubercle is located inward of your patella, you have an internal torsion of the tibia, if is located outward, you have an external torsion of the tibia. Tibial torsion is known to cause gait abnormalities, but it also has been shown to increase load on the hip joint and the patellofemoral joint (Passmore et al., 2018). The malalignment of the patella may lead to instability (Chassaing et al. 2017) which may predispose athletes to dislocation. In fact, some cases of surgical patellar realignment fail because the quadriceps angle is not corrected (Cameron & Saha, 1996). It has also been implicated in Osgood Schlatter’s disease as it places a lateral shear force on the tibial tubercle (Gigante et al., 2003). 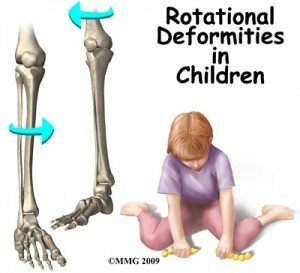 Tibial torsion may be a combination of multiple factors such as genetics, mechanical forces, intrauterine position and the developing child (Cameron & Saha, 1996). Toddlers that “W sit” may be predisposed to external tibial torsion. The hamstring has been implicated to have a mechanical effect on tibial torsion. The hamstring is really three muscles: semimembranosus, semitendinosus (medial hamstring) and biceps femoris (lateral hamstring). They all function to extend the hip and flex the knee. Semimembranosus and semitendinosus attach medially to the tibia, and the biceps femoris attach laterally to the fibula and lateral condyle of the tibia. They have different nerves that innervate them so they can be contracted in isolation. This means there can be differences in strength and tone medially versus laterally. Jonasson et al. (2016), determined that internal tibial torsion favors the medial hamstring while the lateral hamstring favors external tibial torsion. Additionally, they found that athletes that had an ACL reconstruction with a medial hamstring graft had selective weakness of the medial hamstring compared to the lateral hamstring. The lateral hamstring is also the most common lower leg injury and may be prone to scarring and post-injury restriction. Theoretically, if the lateral hamstring is tight, and the medial hamstring is weak, it could place an external torsion force on the tibia. Some other muscles that may contribute to this position is a tight lateral gastrocnemius (calf) and a weak popliteus (muscle behind the knee). One of the functions of the popliteus is to medially rotate the tibia. If the lateral side of the leg is tensioned, and the medial side is not adequately strong enough, imbalances can occur which may contribute to malalignment. If it is truly mechanical in nature, it may be managed with corrective exercises. Namely, elongating lateral hamstring and lateral gastroc with stretching and soft tissue mobilization, and strengthening medial hamstring and popliteus. Adjacent joints would have to be screened for any abnormalities in strength and range of motion, and addressed if indicated. Modifications may be warranted when it comes to stepping/squatting mechanics. This becomes complicated quickly and your best course of action is to see an orthopedic physical therapist. Surgery may be indicated for some. Those with recurrent dislocations and have external tibial torsion 30 degrees or above may be surgical candidates.